Rocksy the raccoon has a habit of helping herself to the cat food in her human neighbor's yard. But she's not very happy when it runs low, so she devised an ingenious way to ask for a refill. 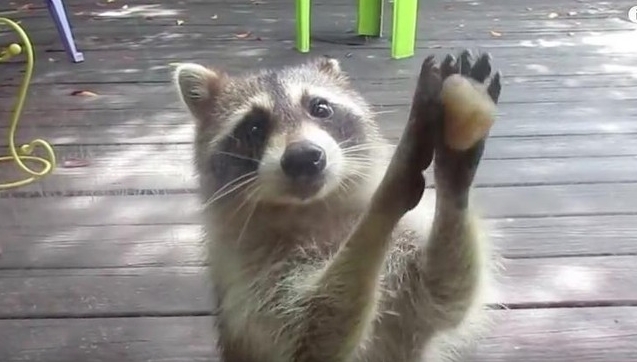 A video posted by her human neighbor shows the wild raccoon eagerly banging on the sliding glass door to get the human's attention. Knowing she wasn't capable of knocking with her own little paws, Rocksy found a large rock, which she rolls between her hands to make a resounding clanging noise as she demands more cat food. "[She] steals the cat food, and when the bowl's empty she gets a rock and knocks on my door," the woman behind the camera says. "It's scratched all the way across here," she adds, pointing to a row of raccoon-height scratches across the glass pane. In the video description, the poster says that the raccoon has shared her yard for years, and that she'll sometimes knock for hours if she doesn't get the response she wants. Rocksy also recently had babies, whom she's nursing nearby, so it's likely she's in extra need of food. "I love her so much," the poster says. "She's so funny." Responses to "Genius Raccoon Knows Exactly How To Drive People Crazy"
They are so smart and so adorable! Cat food is too high in protein for the long-term well-being of a raccoon. Dog food is a more appropriate formulation if someone is going to feed raccoons purposely. Feeding raccoons does have the disadvantage of inviting larger predators to dinner in areas with coyotes, bobcats, cougar, etc. The raccoon's kits are most vulnerable, but a grown raccoon is a formidable opponent if it doesn't want to be on the menu.